There are several forms of contamination in aviation fuel. The higher the viscosity of the fuel, the greater is its ability to hold contaminants in suspension. For this reason, jet fuels having a high viscosity are more susceptible to contamination than aviation gasoline. The principal contaminants that reduce the quality of both gasoline and turbine fuels are other petroleum products, water, rust or scale, and dirt. Water can be present in the fuel in two forms: (1) Dissolved in the fuel or (2) entrained or suspended in the fuel. Entrained water can be detected with the naked eye. The finely divided droplets reflect light and in high concentrations give the fuel a dull, hazy, or cloudy appearance. Particles of entrained water may unite to form droplets of free water. Fuel can be cloudy for a number of reasons. If the fuel is cloudy and the cloud disappears at the bottom, air is present. If the cloud disappears at the top, water is present. A cloud usually indicates a water in fuel suspension. Free water can cause icing of the aircraft fuel system, usually in the aircraft boost pump screens and low pressure filters. Fuel gauge readings may become erratic because the water short circuits the aircraft's electrical fuel cell quantity probe. Large amounts of water can cause engine stoppage. If the free water is saline, it can cause corrosion of the fuel system components. 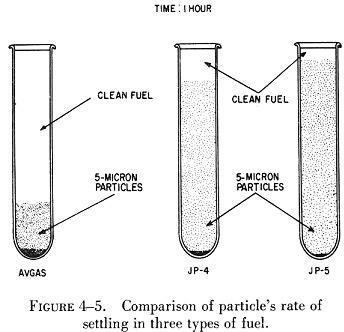 Most foreign particles are found as sediment in the fuel. They are composed of almost any material with which the fuel comes into contact. The most common types are rust, sand, aluminum and magnesium compounds, brass shavings, and rubber. Rust is found in two forms: (1) Red rust, which is nonmagnetic and (2) black rust, which is magnetic. They appear in the fuel as red or black powder (which may resemble a dye), rouge, or grains. Sand or dust appears in the fuel in a crystalline, granular, or glasslike form. Aluminum or magnesium compounds appear in the fuel as a form of white or gray powder or paste. This powder or paste becomes very sticky or gelatinous when water is present. Brass is found in the fuel as bright gold colored chips or dust. Rubber appears in the fuel as fairly large irregular bits. All of these forms of contamination can cause sticking or malfunctions of fuel metering devices, flow dividers, pumps, and nozzles. The unintentional mixing of petroleum products can result in fuels that give unacceptable performance in the aircraft. An aircraft engine is designed to operate most efficiently on fuel of definite specifications. The use of fuels that differ from these specifications reduces operating efficiency and can lead to complete engine failure. Operators of turbine powered aircraft are sometimes forced by circumstances to mix fuels. Such mixing, however, has very definite disadvantages. When aviation gasoline is mixed with jet fuel, the TEL in the gasoline forms deposits on the turbine blades and vanes. Continuous use of mixed fuels may cause a loss in engine efficiency. However, on a limited usage basis, they will have no detrimental effects on the engine. Aviation gasoline containing by volume more than 0.5 percent of jet fuel may be reduced below the allowable limits in knock rating. Gasoline contaminated with turbine fuel is unsafe for use in reciprocating engines. Microbial growth is produced by various forms of microorganisms that live and multiply in the water interfaces of jet fuels. These organisms may form a slime similar in appearance to the deposits found in stagnant water. The color of this slime growth may be red, brown, gray, or black. If not properly controlled by frequent removal of free water, the growth of these organisms can become extensive. The organisms feed on the hydrocarbons that are found in fuels, but they need free water in order to multiply. Microorganisms have a tendency to mat, generally appearing as a brown blanket which acts as a blotter to absorb more moisture. This mixture or mat accelerates the growth of microorganisms. The buildup of microorganisms not only can interfere with fuel flow and quantity indication, but, more important, it can start electrolytic corrosive action. Sediment appears as dust, powder, fibrous material, grains, flakes, or stain. Specks or granules of sediment indicate particles in the visible size range, i.e., approximately 40 microns or larger in size. (See figure 4-5.) The presence of any appreciable number of such particles indicates either a malfunction of the filter/separators or a source of contamination downstream of the filter/separator, or else an improperly cleaned sample container. Even with the most efficient filter/separators and careful fuel handling, an occasional visible particle will be encountered. These strays are usually due to particle migration through the filter media and may represent no particular problem to the engine or fuel control. The sediment ordinarily encountered is an extremely fine powder, rouge, or silt. The two principle components of this fine sediment are normally sand and rust. Sediment includes both organic and inorganic matter. The presence of appreciable quantities of fibrous materials (close to naked eye visibility) is usually indicative of filter element breakdown, either because of a ruptured element or mechanical disintegration of a component in the system. Usually, high metal content of relatively large particles suggest a mechanical failure somewhere in the system which is necessarily not limited to a metallic filter failure. In a clean sample of fuel, sediment should not be visible except upon the most meticulous inspection. Persistent presence of sediment is suspect and requires that appropriate surveillance tests and corrective measures be applied to the fuel handling system. Sediment or solid contamination can be separated into two categories: (1) coarse sediment and (2) fine sediment. Coarse particles clog orifices and wedge in sliding valve clearances and shoulders, causing malfunctions and excessive wear of fuel controls and metering equipment. They are also effective in clogging nozzle screens and other fine screens throughout the aircraft fuel system. 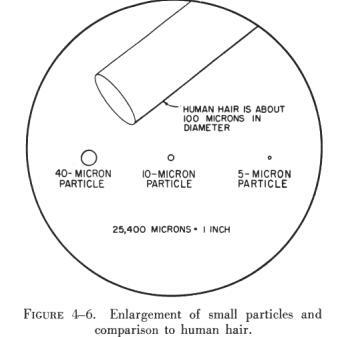 Particles smaller than 10 microns may be defined as fine sediment. (See figure 4-6.) Ninety eight percent of the fine sediment in fuel can be removed by proper settling, filtration, and centrifuging. Particles in this range accumulate throughout fuel controls, appearing as a dark shellac like surface on sliding valves, and may also be centrifuged out in rotating chambers as sludge like matter, causing sluggish operation of fuel metering equipment. Fine particles are not visible to the naked eye as distinct or separate particles; they will, however, scatter light and may appear as point flashes of light or a slight haze in fuel. Maximum possible settling time should be allowed in fuel tanks after filling to allow reasonable settlement of water and sediment. Coarse contamination can be detected visually. The major criterion for contamination detection is that the fuel be clean, bright, and contain no perceptible free water. Clean means the absence of any readily visible sediment or entrained water. Bright refers to the shiny appearance of clean, dry fuels. Free water is indicated by a cloud, haze, or a water slug. A cloud may or may not be present when the fuel is saturated with water. Perfectly clear fuel can contain as much as three times the volume of water considered to be tolerable. Several field methods for checking water content have been devised. One is the adding of a food color that is soluble in water, but not in fuel. Colorless fuel samples acquire a definite tint if water is present. Another method uses a gray chemical powder that changes color to pink through purple, if 30 or more p.p.m. (parts per million) of water are present in a fuel sample. In a third method a hypodermic needle is used to draw a fuel sample through a chemically treated filter. If the sample changes the color of the filter from yellow to blue, the fuel contains at least 30 p.p.m. of water. Since fuel drained from tank sumps may have been cold soaked, it should be realized that no method of water detection can be accurate while the fuel entrained water is frozen into ice crystals. There is a good chance that water will not be drained or detected if the sumps are drained while the fuel is below 32° F after being cooled in flight. The reason for this is that the sump drains may not be at the lowest point in the fuel tank while the airplane is in a flight attitude, and water may accumulate and freeze on other areas of the tank where it will remain undetected until it thaws. Draining will be more effective if it is done after the fuel has been undisturbed for a period of time during which the free water can precipitate and settle to the drain point. The benefits of a settling period will be lost, however, unless the accumulated water is removed from the drains before the fuel is disturbed by internal pumps. The aircraft fuel system can be considered as being divided into three parts when discussing clean fuel. The manufacturer produces clean fuel. Contamination can occur at any time after the fuel is produced. The first part of the fuel system is the delivery and storage system between the refinery and the airport fuel service truck. Although this system is not physically a part of the aircraft, it is of equal importance in controlling contamination. Anytime fuel is transferred it is susceptible to contamination. Therefore, all aviation maintenance personnel should be familiar with the following means of contamination control. 1. Fuel being pumped into airport storage should pass through a filter separator. The filter should meet the requirements of U.S. Government Specification MIL-F-8508A. 2. Turbine fuels should be allowed to settle for a period of one hour per foot of depth of the fuel before being withdrawn for use. This means that ordinarily more than one storage tank must be provided for each grade of product. 3. Storage tanks should be checked with litmus paper after each new load of fuel is received and the fuel has settled. The litmus paper should remain submerged for a minimum of 15 seconds. During periods of heavy rain underground tanks should be checked with litmus paper more frequently. 4. Suction lines should be a minimum of 6 inches from the bottom of the tank. Kerosene storage tanks should be equipped with floating type suction lines. Floating suction does not remove the bottom product, which may not have settled sufficiently. It also prevents reintroduction into the fuel of any contamination at the bottom of the tank. Floating suction is the only logical way to take full advantage of gravity in removing water and particulate matter contamination. Its importance must not be minimized. 5. Fuel being withdrawn from storage should be passed through a filter separator meeting the specification MIL-F-8508A. 6. Great care should be exercised in loading mobile fuelers to exclude airborne dust and dirt, rain or other foreign material. 7. To lessen the likelihood of rust and scale the tanks of mobile fuelers should be constructed of either stainless steel, nonferrous material or steel coated with a reliable, inert material. 8. As turbine fuel is being dispensed into the aircraft from truck or hydrant it should be filtered to a degree of 5 microns for solid particles and contain no more than 0.0015 per cent of free and entrained water. Bypass valves around the filter should not be permitted. 9. All the quality control procedures usually followed in handling aviation gasoline should be employed. These include regular and frequent check of filter separators; frequent quality check such as the "clear and bright" test; and continual emphasis on cleanliness. Examples: "Don't let the hose nozzle drag on the apron." "Keep the dust cap on the nozzle at all times when nozzle is not in use."